have not yet made their 1979 campaign pledge. cooperation during this important part of our 1979 campaign,"
staled Father Barrish, phone-a-gift chairman. suggests the answer is 'yes.' "
are "two separate issues at hand"
of Jewish education for our children, has outgrown its present facility. but it is given to each and every one of us to be a part of history. [ munity by reservation only.
. Keynoting the event will be Dr.
New York City and reared in St.
United States and foreign lands. During World War II. Dr.
between 12:30 and 1 p.m. Dr.
held on March 28 at the Breakers. being raffled for this event. Anshei Sholom at 12:30 p.m.
origin of Hatikvah will be played. TELEPHONE. GAS AND UTILITY STOCKS! will be master of ceremonies. celebrating Purim will be served. March 14 I .annon Estate Tour. Inn, Churchill Road. 2830 So. Center, 100 N.W. 1st Ave.
Sunday, Feb. 25, at 6 p.m.
inaugurating a "Truly Fun Nite"
Feb. 27, at 8 p.m.
interested bridge players by Dr.
Kalman Apfel and Henry B.
Monday, March 5, at 9:45 a.m.
Tuesday, March 21, at 1 p.m.
employed by any funeral director in the State. It's a trust we've never taken lightly. Memorial Chapel. Inc./ Funeral Directors. Since his arrival in the U.S.
Temple Beth Sholom, 315 N. "A"
information on the claim form. established by the AJC in 1948.
campaign. Over 300 people participated in the tournament. paign cabinet to discuss ways of improving next year's drive. TERMS TO MEET YOUR BUDGET. Slovin, Rhoda Katz and Harriet Draizin. We're Specialists In Israel Securities. Via Telex To Israel Stock Exchange. SER VING SOUTH FLORIDA AND ALL 50 STA TES. Also, the Washington Post's "revelations"
based on two cables prepared by Alexandra U.
Johnson, a junior foreign service officer in the U.S.
U.S. Foreign Service last week. How filthy even the most "distinguished"
the international campaign to vilify Israel. made subject to Egyptian rule. to start speaking for themselves. flourish in our climate of freedom. students in their student bodies. Supreme Court ruling in 1954.
mean a loss of tax exemption. be trampled in the process. ".'.' '< \ ..' . ','J > '. V>' "
'i i ,i ,. I, i ya"
in living in new surroundings. was the handling of baggage. groups, I explain all of this. 2120, and ask to speak with Mrs.
the silence a woman's voice. only a degree of Sacred Music. will sign a peace treaty. helm, or there will be a civil war." of its rooms and public area. tional Tours at (800) 221-2600. MIAMI BEACH, FLA. 33140 26th ST. COLLINS AV. the Arab world as well." and a free gift too! various aspects of holiday food. and a table with food for sale. director of Temple Beth El. with the assistance of the JCC. a moment at the Musicana. The editor, Col. Hinter L.
' 'patrons at the "Musicana." THE BRAN CEREAL WITH TA'AM. want, plus it's crisp and light. Mrs. H. Irwin Levy Mrs. Levy is Women's Division president. summer program, call the Center. Camp size will be limited. Carnival will be held at the JCC. program is for members only. Hal Farancz at the JCC. second annual Seder on April 11. Hall every Friday for over a year. nesday, Creative Writing, 9 a.m.
Tuesday, Feb. 27 at 1:30 p.m.
Wednesday, Feb. 28 at 1:30 p.m.
because after all, service is our game. We also provide Free Checking to folks over 60.
available. No annual fees or dues. the other eight easily accessible First American offices. account. Then we can accept your utility payments, too. 900 am 5 00 p.m.
: to help the helpless. is in all Israeli schools. national or social origin ." develop all its abilities to the full. ralher than a theoretical norm. Youth Aliyah came into being. Youth Aliyah from its inception. i the crumbliest crackers, matzohs and muffins. jur money back from Kraft. The Cream of CheesePhiladelphia Brand Whipped cream cheese. guest speaker for Temple Beth El forum series on March 4 at 8 p.m.
:: Women's American ORT East 1 p.m.
5 National Council of Jewish Women 8 p.m.
X B'nai Torah Congregation Adult Education 7:30 p.m.
: Flea Market 9 a.m. to 4 p.m.
music will highlight the event. Division; Rose Rifkin, Keynoters chairperson. Lynn Persoff, Pioneers vice chairperson. j: Temple Beth El Adult Education B'nai B'rith Noah 10a.m. 1 JEWISH FEDERATION LEADERSHIP DEVELOPMENT-8 p.m.
ft B'nai Torah Congregation Yiddish Culture Club 7:30 p.m.
ft National Council of Jewish Women-10 a.m. to 2 p.m.
^ Temple Bejh El Sisterhood- Lunchon 12:30p.m. them against such unfair tactics. purports to be the People of. the revised edition, or else. as a human rights issue. more on that, another time. .
chairman; Jerry Hartman and Arnold Lampert. fie Feinberg as Mrs. Feinberg looks on. Golden, guest speaker; and John Moss, co-chairman. Itly for an organizational meeting at the Federation offices. \be Szmukler, chairman; Dr. Peter Sherman, Dr. Allan R.
ind Dr. Peter Wunsh. Seated from left to right are Dr.
and a top Vatican spokesman. i further the peace process. i are to be resolved. Prime Minister for three years. situation in the Middle East. Israel Bonds, announced that Dr.
chairman of the dinner. Dr.
: ORT Palm Beach 1 p.m.
;: Jewish Committee Breakers Hotel Open meeting 8 p.m.
8 Jewish Community Day School cocktail party 8 p.m.
Board 10 a.m. Jewish Community Day School Board 8 p.m.
Board 10 a.m. Hadassah Bat Gurion Board Hadassah ;? Palm Beach County for 17 years. Mrs. Arnold Kramer, A. L.
that would be yours in IsraelSTOP DREAMING. scheduled and meaningful job offers will be made. losts Barbara Shulman and Steve Gordon. the report and its conclusions,"
said of the Post's presentation. Johnson, a visa officer at the U.S.
tained by the Washington Post. in the Post's story about Ms. He said her "selection out"
* S Boca Raton, Flo. 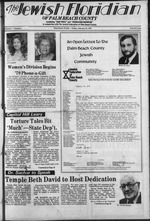 Ihe Jewish Federation of Palm Beach County. ISM I MUSMX m HOWS. U NY. 1283 CONEY ISLAND AVf. BN.YN. NY. elect Chacas Freitas of Rio de Janeiro State. that settled in Brazil early in the century. 8:15 p.m. Saturday, 9:15 a.m. Torah Study with Rabbi Merle E.
West Palm Beach, Fla. 33411 Sabbath Services, Friday at 8:15 p.m.
Church, 115 N. Federal Highway. a.m., Sunday at 9 a.m.
at 8:15 a.m., Friday at 8:15 p.m., Saturday at 9a.m. Gardens, 321 Northlake Blvd., North Palm Beach, Fl. 33408 Ph. Visit the Salon without obligation. and leels so very natural! IThurs. March 153.00p.m. 8:00 p.m. Wed March 21 J 00p.m. 8:00p.m. leader Sabbath Services, Friday at 8:30 p.m.
United Presbyterian Church, Palm Springs. Friday at 8 p.m., Saturday at 9 a.m. Daily minyans at 8:45 a.m.
tracted the majority of our people. kept them glued to their seats. will com* to your hom or bank. tut ions of higher learning. The Arab spokesman is Dr.
Industry last week at the St.
Jerry A. Robertson, run a happy airline. of low-fare seats is limited. Coach Fares start at $133 round trip. Fares start at $150 round trip. AU fares subject to change without notice.